The physical design of the Physics Plank 1.0 was very simple. 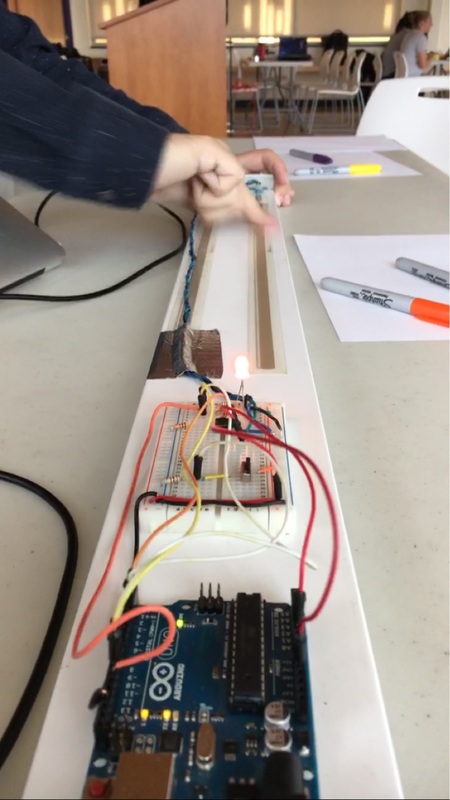 Its only components were a board, ribbon sensor, Arduino Uno, bread board, appropriate wiring, and the LED light. It could only function if it was plugged into a computer since it had no other power source. We developed code that would calculate frequency based on how many peaks were created in a certain sample time. It did this by evaluating the sign of the change value between the previous reading from the sensor and the current reading from the sensor. When the previous sign was positive and the new sign was negative we knew that the movement on the sensor had changed from increasing to decreasing values and therefore had reached a peak. Once it had calculated the frequency it would light up a LED to the color that would correlate with that frequency.